We are availble 24 hours a day, 7 days a week for emergency repairs, service or spills. We welcome the chance to earn your business. 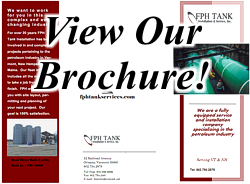 Please, contact us with any questions, concerns, project plans and we will gladly demonstrate what FPH Tank Installation and Services can do for you.